Flint City Councilwoman Kate Fields sits left of Councilman Wantwaz Davis. FLINT, MI – Flint Interim City Attorney Angela Wheeler has warned City Council members of a breach of confidentiality after an email was sent out to non-city officials regarding whether Mayor Karen Weaver’s adviser Aonie Gilcreast had been vetted. The memo, dated June 2, 2017, was sent to council members from Wheeler after Councilwoman Jackie Poplar asked for a legal opinion regarding whether Gilcreast had a background check. “The problem is if the council comes to me on a confidential opinion on anything…then it should not ever be communicated outside because it’s for the benefit of the decisions that you’re making,” Wheeler said to the council during a June 7, 2017 committee meeting. 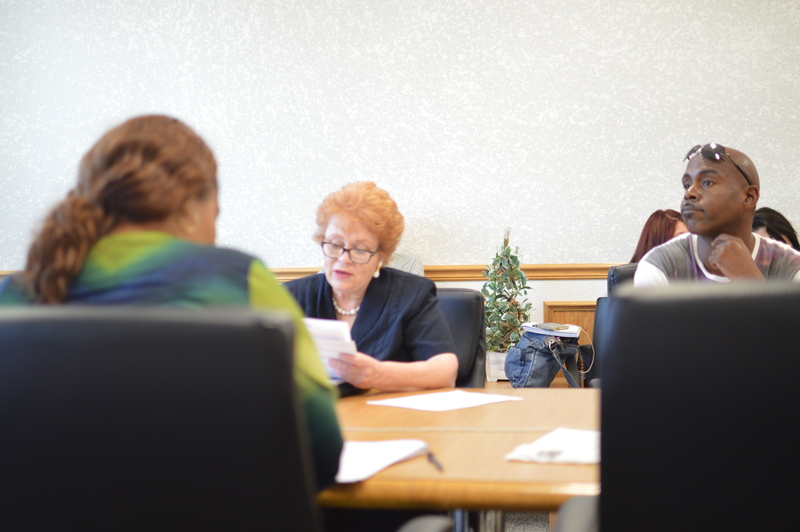 Flint City Council voted in the June 7 meeting to take the issue into executive session during a June 12, 2017 committee meeting to address questions. Some council members have questioned Gilcreast’s role at city hall including Weaver’s attempts to put Gilcreast on the city’s payroll. Councilwoman Kate Fields said after the memo was sent to non-city officials the legal department checked council members’ email accounts. Fields asked that city council put in a request for outside legal representation to look into claims that Wheeler checked council members’ email accounts saying it was an invasion of privacy. Councilman Scott Kincaid said there is a process for the council to go through to secure outside legal representation including submitting three attorneys to the city’s legal department and submitting a reason as to why the city needs an outside attorney to investigate an issue. Kincaid said he would help Fields with her request for outside legal help. The fact that city council had this happen just proves Mayor gets away with to much!! Why she fired the last city attorney because she wouldn’t break the law like this! !